Giant-Size Geek: Photon Torpedoes is Dead. Long Live Giant-Size Geek! And How I Made a Geeky Masthead. Photon Torpedoes is Dead. Long Live Giant-Size Geek! And How I Made a Geeky Masthead. Spelling Photon Torpedoes in a browser, twitter, or email, was a pain. Does the word Torpedoes contain 1 or 2 of the letter “e”? I felt like Dan Quayle every time I typed it. What is a blog called Photon Torpedoes about, other than Star Trek or science fiction? I had this idea, since my other blog, Giant-Size Marvel, is fairly popular, why not create another Giant-Size blog? Photon was really about everything Geeky that I liked and my co-writers liked. Giant-Size Geek was perfect, the domain name was available, so were the Twitter, Gmail, and Facebook accounts. I wanted to have the same Giant-Size logo style as the Marvel blog, but with a different color scheme to distinguish it better. Giant-Size Doc Savage had a red logo on a light blue background, which I though was pretty good. I wiped out the rest of the Doc Savage logo and smoothed out the blank area below the logo. Later, I would wipe out the “Marvel Comics Group” on the header and the words Doc Savage on the upper left. That blue circle surrounding Doc had to go, too. I moved Doc over to the left a bit. I needed more room for the word GEEK and the superhero characters I wanted to populate that area. My biggest problem was where to find a Geek logo? 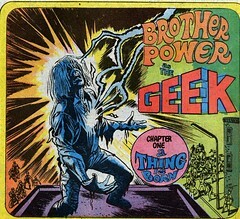 The most famous Geek in comics history is DC Comics Brother Power The Geek, who had a 2 issue run in 1968. I didn’t quite like the logo from the covers, but the inside splash page of issue #1 had a logo that I liked. I took this and changed the colors to make it make the Giant-Size scheme. I took a variety of characters that I’ve liked ever since I was a kid, and tried all kinds of arrangements plugging them in. They had to be DC Comics, Science Fiction, or Pulp related characters. I didn’t want Marvel as that is on my other blog. I did toy with using Deathlok from an Astonishing Tales masthead. I also toyed with using Ron Ely as Doc Savage (from the 1970s movie poster) and Lynda Carter as Wonder Woman. Real life characters look a bit strange next to silver age drawings, so I nixed that idea. 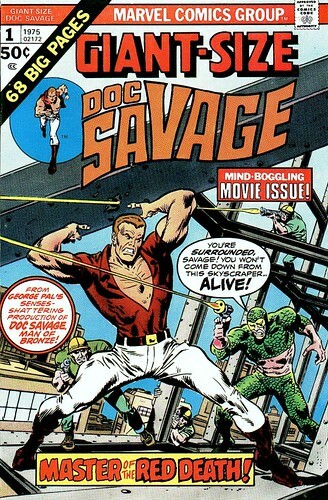 Doc Savage, drawn by Ross Andru, from the Marvel Doc Savage series. Adam Strange, drawn by Carmine Infantino and Murphy Anderson. Superman, by Neal Adams, from the famous Superman #233 “Kryptonite Nevermore” issue. Geek logo from Brother Power the Geek #1, 1968. Green Lantern by Gil Kane and Kevin Nowlan from the 1996 GL Gallery. You will probably see this character lineup change over time. I already have some ideas for Halloween.